This will be busy week ahead for all those volunteering at A Celebration of Quilts XIII. Quilts will be dropped off between 9 am and noon on Thursday November 9th. Meanwhile quilt racks are being set up and placed throughout the facility, and then the hanging of quilts begins. No one goes home until we are all happy with the layout! When you arrive to see the show, you will find the sales ticket table and volunteer sign in desk, as well as a display of our Raffle Quilts. A special shout out to Bev Sturgeon for navigating the system to get our raffle license! Buy your raffle tickets when you arrive, then proceed to the Loonie Sale area, also in the front lobby. There will be a wide selection of items so buy lots of tickets and drop them into the bags for the items you want to take home with you. More tickets = more chances to win! When you have spent time studying the quilts at this year’s show, take a break! Marche 59 is located on the second floor, and will be enticing you with a selection of food and drink. Then remember to visit Shop at the Guild, located in the Studio Space on the second floor. There will be a wide range of items for sale, all made by YHQG members. Come see what they have been up to! To make your shopping easier, we now accept cash, debit and credit cards on all purchases. And a special thanks to Quincy’s Quilting from Leduc Alberta for a very generous donation of fabric. Their booth was directly behind us at CreativFestival last week, and some of their fabric fell off the back of the table into our booth- so that is how we met! This fabric will be part of the Loonie Sale in the Front Lobby. 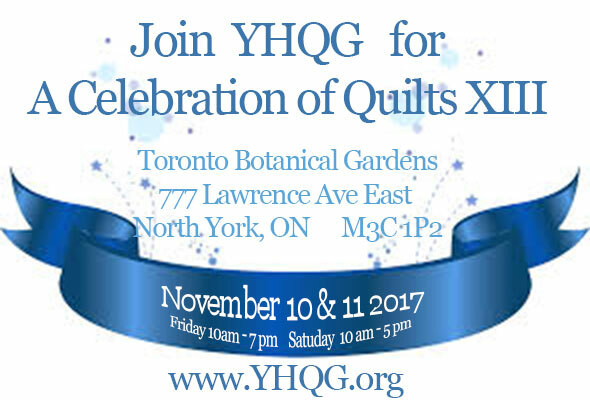 Remember to tell all your friends about this show.. it only happens every three years, and is always filled with quilts that will amaze and inspire.